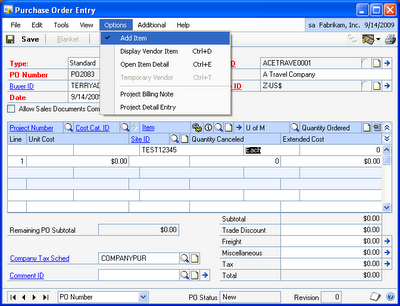 Companies that use the Inventory module and manually enter purchase orders for their items may find this tip useful. When entering POs for inventory items, manually typing item numbers can lead to errors in the PO because, unless you check the 'Add Item' checkbox prior to data entry in the PO, there is no validation against incorrectly entering an item number. (Note - in GP9 and previous versions, find 'Options' under the 'Extras' menu in the main menu bar). 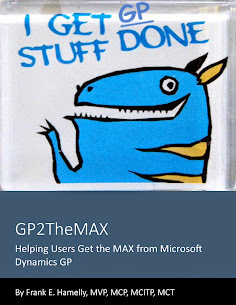 GP validates the item number entered and if the if it isn't a valid item, the dialogue box opens asking if you want to add the item you've just typed. Although not officially a warning, it can be used as such to advise that an incorrect item number has just been entered. Of course, there are times when you're ordering non-inventory items so if you don't want to add the item, just click 'No' and continue processing the PO. If it is a new item and you do want to enter it in the item master, click 'Yes' and the Item Card opens. Unfortunately, the default setting for the 'Add Item' Option is 'unchecked'. Also, even if you have checked the Add Item Option, as soon as you close the PO Entry window, the checkmark is cleared and you have to remember to re-check the Option each time you open the window. Not cool, to say the least. However, all is not lost. There is a chunk (.cnk) file available from MBS Professional Services that changes the default setting to 'checked'. And, believe it or not, it's free of charge. Why this isn't included in GP out-of-the-box is a mystery. Now, if you don't know how to contact MBS Professional Services or would rather take an easier route to getting the Add Item chunk, shoot me an email at fhamelly@eastcoast-dynamics.com. I have the file and will email it to you. Until tomorrow . . .